The Legislature's Seventh Special Session is a lesson in semantics for Arizona families. It seems that lawmakers are trumpeting the restoration of half-day Kindergarten. While some argued that a cut is a cut - not a restoration, there were not enough votes to save the $218 million appropriation to the full-day kinder program. Lawmakers in both the House and the Senate spent more than nine hours in committee on Tuesday, March 9, engaged in heated debate in between hearing public testimony. The elimination of state programs such as KidsCare, a healthcare program for children whose families are well-below poverty level, and the near elimination of the Department of Juvenile Corrections, are but two examples of the impact of this bill to programs vital for children and public safety. Adding insult to injury was the surprise addition of a $98 million appropriation from the state's general fund to the Department of Corrections for an additional 6,000 "beds". That's 2,000 private prisons beds at approximately $20,000 each for a total of $40 million and 4,000 new state prisons beds at approximately $14,500 each for a total of $58 million. Note that the private prison bed price is $5,500 more per bed than the state prison price per bed. The loss of funding for all-day Kindergarten; gifted programs, summer school, after-school programs and preschool programs. Reduced funding for the second consecutive year for basics such as textbooks, computers and equipment for students. Suspension of funding for school building maintenance and repair for the fourth year in a row. An additional $400 million in cuts coming from K-12 schools. $100 million from universities and community colleges. Funding levels of K-12 could be cut to 2000-2001 funding levels. This will push our state back a full decade in funding. For more information, see Prop. 100 - Your Questions Answered. 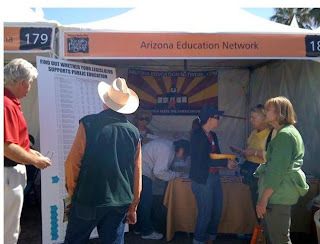 Arizona Education Network handed out thousands of Prop 100 flyers, bookmarks and postcards at the Tucson Festival of Books. We were able to register new voters and sign many up for early voting from home. For those who signed up for our newsletter - welcome! The new Common Core Standards, created by a panel of members of the National Governor's Association and the state Superintendents of Education, was released this week for public comment. The standards were crafted to provide rigorous, uniform education benchmarks among the states, replacing individual state standards of varying levels. The Common Core Standards project is a state-led initiative; not a federal initiative. 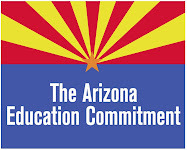 Arizona was an early supporter of the development of these new Common Core Standards and touted its commitment to adopt the standards in their application for the Race to the Top grant. Click here for the full article. Fifteen district overrides passed while nine failed in the March 9th elections. The number of override campaigns, in addition to the victories for many districts where overrides had previously failed, shows communities are mobilizing to protect their public school programs, teachers, and class sizes. Click here for details. AEN is a non-partisan, all-volunteer, nonprofit organization that exists to provide factual information and advocacy for public education. WebXGeneration a free website creation service in India. Here you can create free website free of cost and no programming and designing needed just only in three simple steps you can create your desired website. Hey all students wanna learn website designing or development. You need to visit a good website development company in order to see how much effective designing and development is done by companies. Thank you for visiting the Arizona Education Network Blog! While dialog and debate are both welcomed and encouraged by our contributors on any/all of their contributions, comments will be moderated prior to publishing to ensure they are on topic and respectful. Our team makes every effort to approve and publish comments as soon as possible and thanks you for your patience. For more information on the Arizona Education Network, please visit www.arizonaeducationnetwork.com. Welcome to the Arizona Education Parent Network blog! The Arizona Education Parent Network exists to provide parents, students, businesses and community members with accurate information and the resources to enable them to take action on behalf of Arizona students. The Arizona Education Parent Network was conceived with no outside funding and is operated in conjunction with parent groups and friends of public education from across Arizona. We are a non-partisan coalition and we strive to find solutions to our current public education crisis. Subscribe to the AEN Blog! Locate a Parent, Student & Community Group Near You!